I have no information about this and it currently appears to be a work in progress. 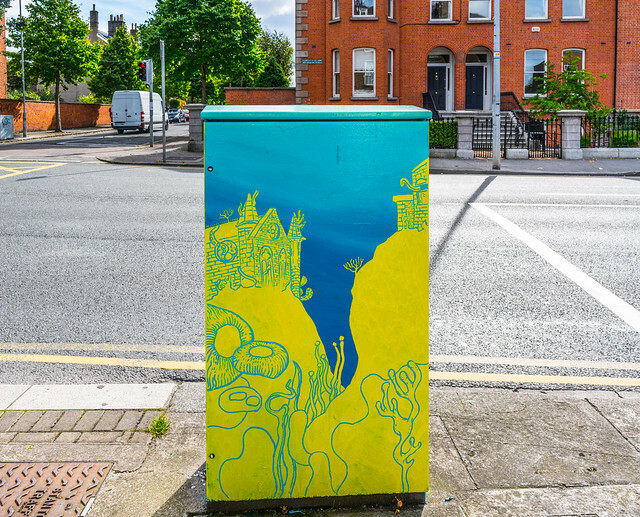 It is not listed on the Dublin Canvas map. Heytesbury Street is a tree-lined inner city street north of the South Circular Road, Portobello, Dublin, Ireland named after William à Court, 1st Baron Heytesbury (1789–1860), Lord Lieutenant (1844–1846). Built and developed as an artery to join Portobello Harbour about 1820, its current layout dates from the mid-19th century. It is primarily a residential street but also contains a school: Synge Street CBS is officially known as St Paul's Secondary School, Heytesbury Street. Jonathan Swift had a vegetable garden and a paddock for his horse nearby. The entrance to the Meath Hospital was located on this street. The hospital's foundations were laid by Lord Brabazon in October 1770. The hospital was initially known as The Meath Hospital and County Dublin Infirmary, but was renamed on its move in 1823. James Clarence Mangan and Brendan Behan were patients in the Meath Hospital and died there. Oliver St John Gogarty (Buck Mulligan in Joyce's Ulysses) was on its staff from 1911 to 1939. No. 33, Heytesbury Street was the birthplace of Cornelius Ryan, author of The Longest Day, The Last Battle and A Bridge Too Far. No. 72, Heytesbury Street houses one of Ireland's leading contract bridge clubs, the Civil Service Bridge Club.